I am offered items to review almost every day; everything from iPod cases to large format printers to hard drives to monitors to the plethora of software available on the Macintosh. Most things I turn down, as there are only so many hours in the day, and only so much space in my office for another piece of hardware. So when the opportunity came up to review the ScanSnap, I was surprised that I actually wanted to. I had in my mind, before the unit arrived, what the ScanSnap was all about. A document scanner, not a flatbed scanner. I read it does duplex scans (both sides of a document at the same time) and outputs directly to Adobe Acrobat format. It all sounded good to me, but the proof is in the pudding. Well, the pudding is small, as in tiny, it is fast, and it tastes really good! Okay, enough of the metaphors. The ScanSnap is so much smaller than I had thought it would be. When I first unpacked it, I looked back in the box to make sure there was no base unit or something I did not see. This thing is about the width of a half loaf of bread, and the depth of half that! Small and tiny, just the sort of thing my desktop work area appreciates. Size matters, yes, but not as much as functionality does. If it does not work as advertised, well, it could be the size on an iPod and I would not be impressed. 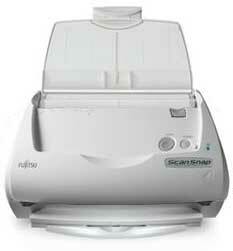 Thankfully, the folks at Fujitsu have not let me down, as the ScanSnap works and works very well. Installation is painless but does require a restart. I noticed that there is no TWAIN import functionality, but for the purpose this document scanner was created for, I don’t see this as a negative. You won’t use the SnapScan for importing high-res graphic files. For that, a drum or flatbed scanner would be more appropriate. On the software side of things, SnapScan uses Adobe Acrobat Standard, which comes free in the box with the scanner. When a document is scanned it (more on that in a moment) it is saved as an Acrobat file. This is great for a number of reasons. First, Acrobat has become the default document format for transmitting and printing most documents. It is flexible, easy to use, but also powerful enough to use as an electronic workgroup and documentation online (or off) workflow. You can set passwords in Acrobat so that you can have some control over who can / can’t open sensitive documents. Spotlight can also search text within PDF files, although not documents scanned with the SnapScan, as these documents are scanned as a picture, without any OCR involved. No OCR (Onscreen Character Recognition, the process of a software application understanding text when it is scanned in and converting it to editable text and font) is probably the most disappointing aspect of the SnapScan. While it is great to be able to quickly and painlessly scan in all your important documents, there is no way to search for text within those scanned files. Also, the user is not prompted to name each file as it is scanned, so to create somewhat of an organized structure of your scanned documents, the user is forced to go back and rename files. I found doing a Save As in Acrobat worked well, after which I would delete the original scanned PDF. The SnapScan settings give the user a good combination of options such as compression rate (the lower the compression, the greater the scan quality, Paper Size (I leave it at Automatic Detection, which works great), file format (don’t like PDF? Save your scans as JPGs instead), Scanning options (quality, color mode, and scan button), Save options, and Application options in case you would rather Preview open the scan over Adobe Acrobat. All in all, most of the option a typical user would need to control the scanner. The ScanSnap software automatically launches at start up, so there is no need to hunt and find the application to start scanning. The software and hardware is all ready to go. The most impressive aspect to the ScanSnap has got to be the speed a document is both scanned and displayed on screen. The advertised speed is 15 pages per minute, which may not sound like much at first, but basic arithmetic will show that is four seconds for one page. And not just one side of the page, but both sides of each page! The scanner is intelligent enough to know if what you are scanning is a one or two-sided document, and acts accordingly. One button scanning. Add the document(s) you want to scan in the feeder (50 sheets capacity) and push the big round button, and the ScanSnap takes it from there. It is so simple; the ScanSnap is the Macintosh of small office documents scanners. I had so much fun working with the ScanSnap; I got carried away scanning every document I could find. Mortgage papers? Checks. Insurance papers? Check. Old pay-stubs? Birth certificates? Receipts? Check, check, and check. The scanner is so simple to use, and PDF’s small enough (even on high quality settings) to easily archive, I feel this is the first document scanner I can use to truly move all my important papers into electronic format. Compatible with Mac OS X 10.2 and up.